Seven years ago, before launching Femgineer and having Kim Scott on FemgineerTV, I had to make my first sales hire for my second startup, BizeeBee. I had never hired a salesperson before. Most of my hiring experience had been with technical folks such as engineers, designers, and product managers. I just figured it would be the same. Find someone who is capable, comes with good references, and then give them some time to ramp up. I decided to hire Adam. Adam had requested a pretty steep salary for a startup. I figured he’d end up paying for himself with sales, so I didn’t balk at his salary. Adam’s first month in, I wanted him to feel like he was part of the team because he was one of two non-technical people on it. I made sure to communicate that I was happy to have him on the team. I didn’t know how to onboard Adam but figured he had enough experience, so he didn’t need me to onboard him. And I made myself available to answer any questions or concerns that came up. Adam reached out to prospects daily. At the end of the week, he informed me of how things were going. I helped him understand the product and work through customer objections. By month two, I noticed that Adam hadn’t made any sales. My co-founder and I were starting to get nervous. Adam was the highest paid person on the team, and his salary had almost doubled our burn rate. My co-founder suggested that I talk to Adam. However, I didn’t want to step on Adam’s toes. I reminded my co-founder that we gave our technical team lots of autonomy and we should do the same with our sales team. I went back to praising Adam and making sure he felt like he was a part of the team. Month three crept upon us rather quickly. By then, other people on the team, who weren’t particularly skilled at sales, were closing customers. Meanwhile, Adam hadn’t closed a single customer. Those who had closed sales became more vocal about Adam. They came up to me and expressed their concern, which quickly evolved into frustration. I wasn’t sure what to do. My co-founder and I had a conversation. We talked about how I could coach Adam. The next day, I pulled Adam aside. I told him that we weren’t happy with his performance and needed to see more sales within the next month. Adam was shocked because I had been giving him nothing but praise. I realized what I had done. I had been Ruinously Empathetic and held back on giving Adam the feedback that he needed to do his job. Adam didn’t know those were our expectations. He thought he was doing a good job educating prospects. Given how young the product was he really didn’t think he was capable of closing sales. He told me we needed someone who was much more experienced with selling new products and it wasn’t him. So at the end of our conversation he concluded that it would be best for him to leave. I felt terrible. Because I hadn’t had this conversation earlier, both Adam and the company had lost valuable time. After Adam left I took some time to reflect on what I had done wrong. My first mistake was not taking the time to fully understand what goes into hiring sales people and helping them be effective. I made up for it with my second mistake by not challenging directly. Showering Adam with praise that was unspecific, and thinking that if I was just nice to Adam, everything would work out. The third and final mistake was not listening to the others on my team. I dismissed their early feedback, thinking that they were being too harsh, but they weren’t. They were looking into the best interest of the company and bringing to my attention that I was failing to do my job. After the experience, I took the time to educate myself on what it takes to hire and train sales people. 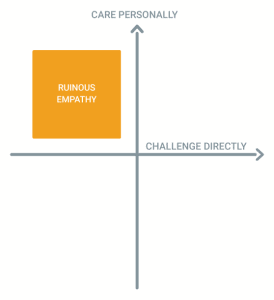 I also let my team know that I appreciated them for having the courage to practice Radical Candor, to Challenge me Directly while showing that they Cared Personally. Had they not spoken up, I would have just kept going. I made sure that they knew going forward I’d do a better job of listening when they gave me feedback, and even do better with asking for their Radical Candor. Withholding feedback that can help someone do their job better because we’re afraid of their reaction is an act of Ruinous Empathy. In the end, we set them up for failure. We also have to learn to listen to feedback that is directed towards us, even if we don’t initially agree with it or understand it. Otherwise, we set a bad precedent that our behavior is right and theirs is wrong. When was the last time you failed to Challenge Directly because you were trying to be nice? How did others around you take it? And what did you do to course correct it? Marc Murphy, CEO at Atlatl Software, wrote us recently with this great feedback story, and a great new term to start using. Marc met with a manager on his team and had a great, candid session. Marc shared some feedback with the manager. When he finished, the manager said, “Now can I share some feedback that I have for you?” What came next was some of the best feedback Marc has received as a CEO, and it made an immediate impact. So proud that we are building an organization that is open to the candor boomerang. 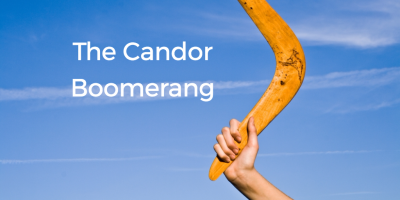 We love this story and this new term, the candor boomerang! People can feel that it is pretty risky to offer feedback to their boss, and it’s so powerful when they feel comfortable turning the table. 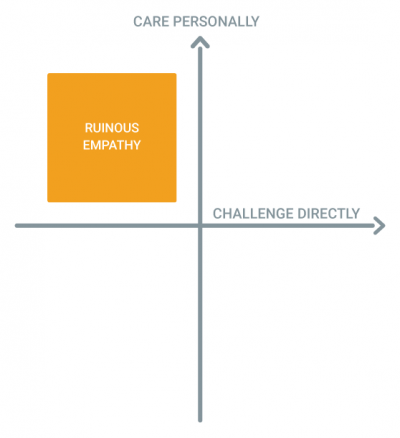 As a boss, are you creating a safe space so your team can share feedback with you? For tips on this, check out our articles about how to get more feedback and how to take feedback well. 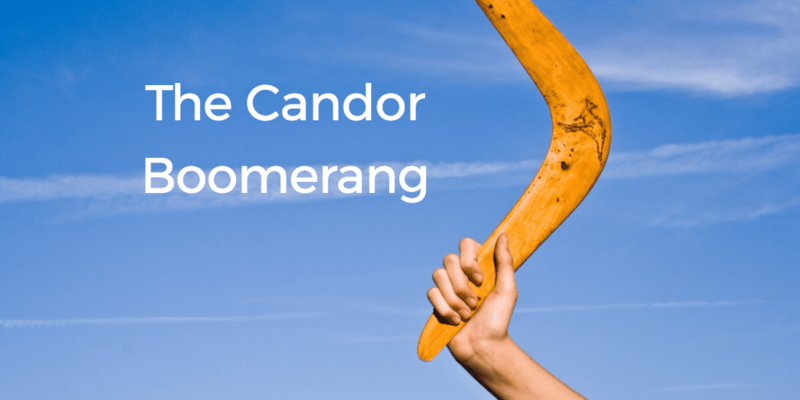 Have you experienced a candor boomerang? Share your story with us!